Dinosaur Island supports cannibalistic dinosaurs! Just click on the ‘cannibal’ box. Dinosaur Island supports such behavior. 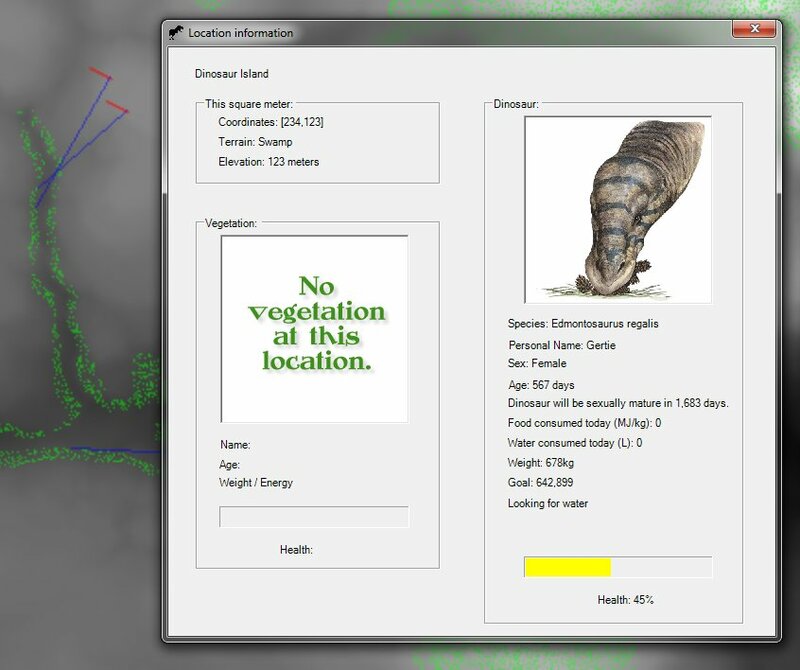 When creating a dinosaur species in the simulation, just click on the ‘cannibal’ box in the ‘diet’ section. Thirst or hunger? What is more important to a dinosaur? What is more important to an animal that is very hungry and very thirsty: water or food? I just encountered this problem when writing the AI code for dinosaurs finding food and water. When ‘new’ dinosaurs are currently created in Dinosaur Island they haven’t yet eaten or drunk water so the stored values for every new animal is ‘0’. Obviously, we can, and will, change that so ‘new’ dinosaurs are created with some values (these ‘new’ dinosaurs are not ‘just hatched’ dinosaurs but rather adult animals that are created and placed on Dinosaur Island for testing purposes). 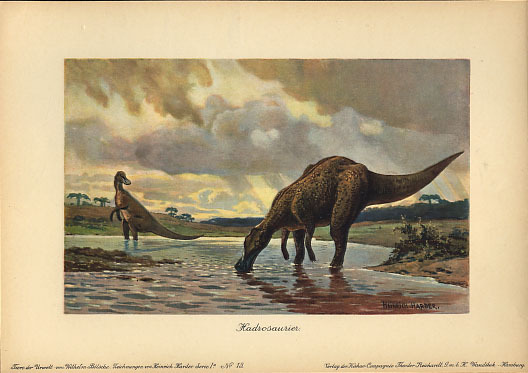 Screen capture showing a very thirsty Edmontosaurus named Gertie who is now walking towards the closest observable water (click to enlarge). The above screen capture from Dinosaur Island shows a very thirsty Edmontosaurus, named Gertie, that can see fresh water (solid blue line) in a nearby tributary. It is interesting to note that because of the height of the river bank Gertie can only see the water on the far side of the tributary. Nonetheless, Gertie is now moving towards the water she can see and will stop and drink as soon as she encounters it. While working on the AI routines for a dinosaur finding water (see also Dinosaurs, tanks and line of sight algorithms here) I realized that some dinosaurs travel in herds and that where the herd goes is the decision of the leader. Consequently, we will need to have the ability to designate one dinosaur in a group as the leader and the others as followers. Were dinosaur herds matriarchal (led by the senior female, like elephants)? Were dinosaur herds patriarchal (like buffalo)? We just don’t know the answer to these questions but we will be able to explore the possibilities by using Dinosaur Island and observing the results. The just added Herd Leadership variable (Matriarch, Patriarch or Neither in bottom right). Edmontonsosaurus, by default, is now a matriarchal herd. Screen capture (click to enlarge). Edmontosaurus regalis is now, by default, a matriarchal herd which means that the senior female decides where the herd goes, where it eats, where it drinks, where it rests and how to avoid predators. The default for Tyrannosaurus rex is ‘Neither’ or no herd leadership.